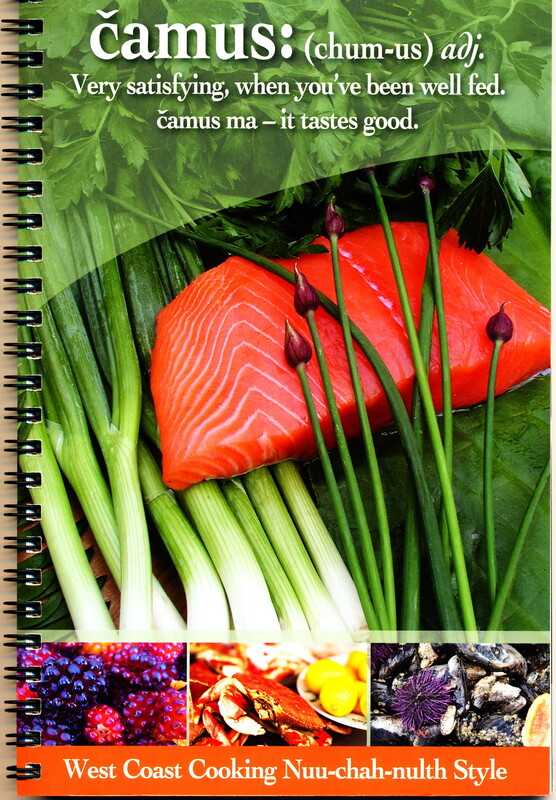 Čamus is a Nuu-chah-nulth word that means “Very satisfying when you’ve been well-fed” and the cookbook of the same name is featured in this book review. The book is published by Uu-a-thluk, an aquatic management organization interested in the economic development of ocean resources in Nuu-chah-nulth territories. They state that the purpose of the book is to encourage the use of traditional foods in the diet, and thus healthful eating especially among youth. They also note that the food we eat is a major contributor to cultural identity. The recipes in this book are in three sections: Ocean containing recipes for fish, whale, crabs, prawns and kelp; Beach containing recipes for oysters, clams, gooseneck barnacles, mussels and smelt; and Land containing recipes for duck, elk, deer, berries, bannock and bread. Community members who are named have contributed the recipes that are all written in Imperial measures. The Nuu-chah-nulth territories are on the West side of Vancouver Island and the introduction includes a map. The introduction also includes a “Seasonal Round” a clever and useful device for linking food availability to months of the year. This is a tool that can be valuable to anyone interested in eating locally. The book includes detailed instructions on how to butterfly salmon and prepare it for a barbeque, how to steam pit cook, and how to can salmon. The book is 90 pages, coil bound and pleasantly illustrated with colour and historic black and white photos. A list of recipes is included at the back, a table of measurement equivalencies, and two pages of Nuu-chah-nulth phonetic alphabet. Because this book is mainly written to promote use of food from the ocean, it will be of most interest to those who live close to the ocean and can harvest their own foods or have access to unique items such as seaweed and salal. The book will also be of interest to anyone who is working on a community cookbook as it provides an early example of highlighting food sources and the land. The book can be purchased online: http://uuathluk.ca/cookbook/ or in many bookstores. Uu-a-thluk (2008). Camus: very satisfying when you’ve been well fed, West coast cooking Nuu-chah-nulth style. Port Alberni, BC: Author.